What more will be done to dehumanize the Jews? It seems almost like 1933 all over again, but this time in England with publication of this cartoon in the London Sunday Times! For a change, an organization other than the BBC is in the forefront of British pro terrorist propaganda. Sadly, some apologists, who claim to be Jewish, thought this wasn’t designed to inflame more antisemitism. 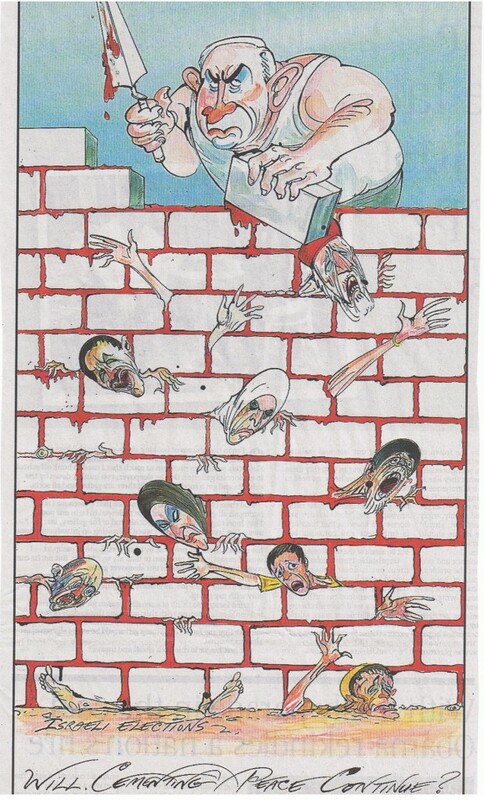 Instead, they arrogantly declared this hateful drawing just took a purely political stance, and the cartoonist didn’t really mean to actually suggest bodies of dead Palestinians were used to build a wall in Israel. The next cartoon – blood libel? Did you ever wonder why you never heard of wolf chops? UK’s Anti-Semitism is alive and well, nevertheless they deserve what is coming to them via terror brought out by millions of Muslims living in the UK and with many of them approving with ISIS proclaims.